We have two versions of this document. This one is drawn as a "terms and conditions" document which is non-negotiable. 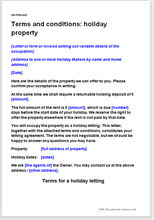 You can send it out in response to an enquiry or post it on your website. The alternative is a slightly fuller version set out as an agreement to be signed. Find it at Holiday house letting agreement. This document is suitable for letting property anywhere in the world. It is in plain English but very comprehensive. Not suitable for a business letting or a holiday letting for more than three months (simply to avoid the tenant acquiring tenancy rights at law - more likely, the longer they remain).